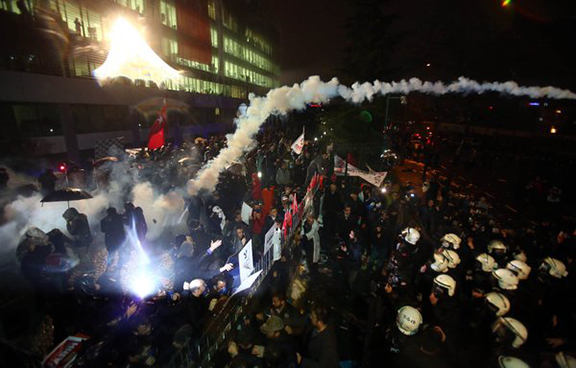 ISTANBUL(Today’s Zaman) — Police raided the headquarters of the Zaman Daily and used pepper gas against thousands late Friday after an Istanbul court appointed trustees to take over the management of the Feza Media Group, which includes Turkey’s biggest-selling newspaper, the Zaman daily, as well as the Today’s Zaman daily and the Cihan news agency. This takeover by the Turkish court deals a fresh blow to the already battered media freedom in Turkey. Employees shouted “free press cannot be silenced,” as hundreds of police officers entered the building. Zaman daily Editor-in-Chief Abdulhamit Bilici, who had a hard time speaking due to the tear gas, said the scene will be noted in the Turkish history as a black stain. Police then went to the management floor in the building. 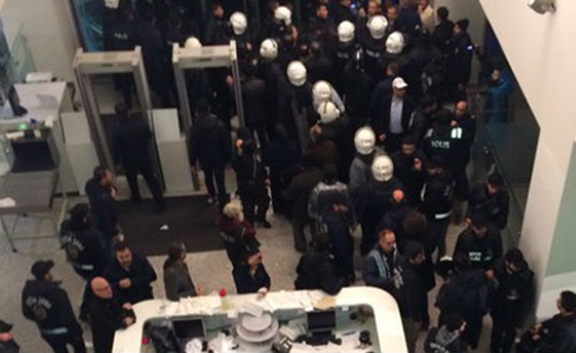 Then police prevented Bilici from entering his office. The decision was issued by the Istanbul 6th Criminal Court of Peace at the request of the Istanbul Chief Public Prosecutor’s Office, which claimed that the media group acted upon orders from what it called the “Fethullahist Terrorist Organization/Parallel State Structure (FETÖ/PDY),” praising the group and helping it achieve its goals in its publications. 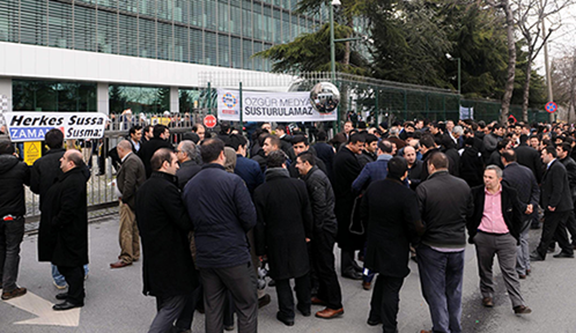 A crowd of Zaman and Today’s Zaman journalists, readers and supporters had gathered outside Zaman’s headquarters earlier in the day as court-appointed trustees were expected to arrive at any moment. 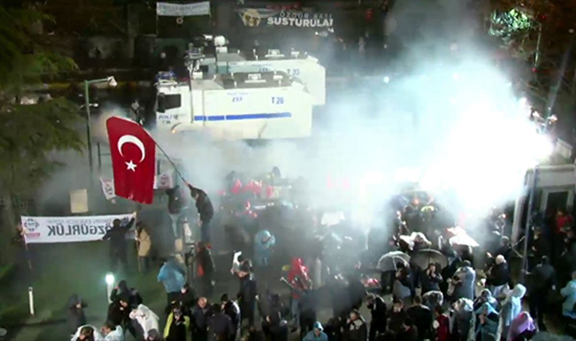 “Today, we are experiencing a shameful day for media freedom in Turkey. 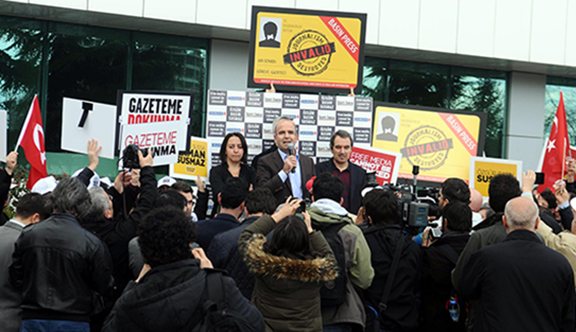 Our media institutions are being seized,” Today’s Zaman Editor-in-Chief Sevgi Akarcesme said as she addressed the crowd. Sahin Alpay, a veteran political expert and a columnist for both Zaman and Today’s Zaman, lamented the situation, saying Turkey is having a “dark day” when one of the most prominent media outlets in the country is being confiscated at the order of a political leader. 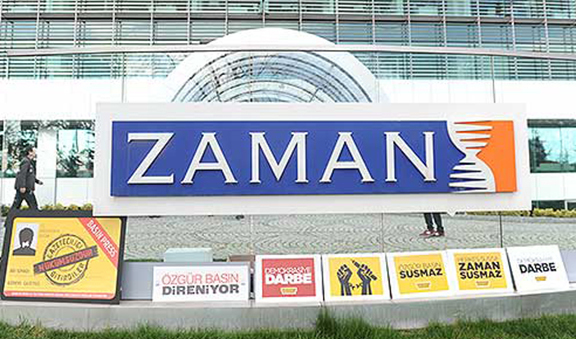 The takeover of Zaman comes as President Recep Tayyip Erdogan and the government of the Justice and Development Party (AK Party) that he founded intensified pressure on the Turkish media. Zaman, which is affiliated with the Gulen movement, is one of the few opposition media outlets in the country, which is dominated by pro-government television stations and newspapers. Turkey’ satellite provider Turksat halted the broadcast of the independent IMC TV station last week on terrorism charges. Two newspapers and two television stations owned by Koza Ipek Holding were placed under the management of a trustee board on charges of financing terrorism in October 2015. Those media outlets were closed down by the trustee board due to financial losses last week. Erdogan declared the Gulen movement, inspired by Turkish Islamic scholar Fethullah Gulen, his number one enemy after a corruption investigation in December 2013 that implicated people in his inner circle. He accused alleged sympathizers of the movement within the judiciary and the police of staging a coup against his rule. The corruption charges were dropped after prosecutors of the case were replaced. According to the court’s decision three trustees were appointed to the Feza Media Group. One of the trustees is Sezai Sengonul, who serves as an editor at a news website. The two others are lawyers are Tahsin Kaplan and Metin İlhan. Ilhan’s social media accounts showed that he is an open supporter of the AK Party and Erdogan. His personal Twitter account’s background photo shows Erdogan and Davutoglu while some of his tweets even included insults at main opposition Republican People’s Party (CHP).